(Русский) Аренда жилья | CENOTE XPLORE | Коттеджи, виллы, апартаменты. 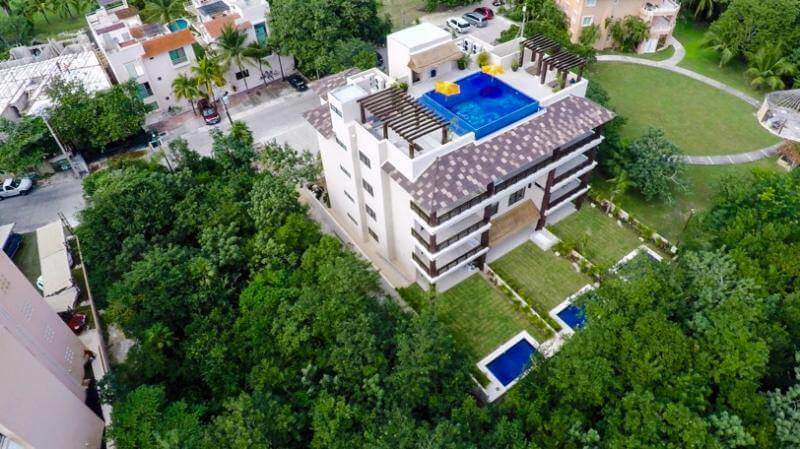 Located in Puerto Aventuras, in the center of the Mayan Riviera, our Apart Hotel offers comfortable accommodation in a very quiet place close to the cenotes. It is a modern place, which rightly combines the excellent quality of the hotel with an affordable price. Surrounded by golf courses and beautiful gardens, this place will give you peace and comfort. The hotel has only 10 rooms. The spacious and bright rooms have plenty of natural light. Room size is 105 square meters. m + 17 sq. m terrace. Luxury bathrooms and comfortable beds – everything you need to relax after a fascinating dives. Beach is 10 minutes away (walking distance).. There is a public swimming pool on the roof of the hotel and free parking lots. Each room has Wi-Fi. The apartments have an equipped kitchen and everything you need for a comfortable stay. Apartment with a private garden access. The room is furnished in a modern style, with comfortable beds and spacious bathrooms. Maximum for 4 adults. Amenities include a private garden with a heated swimming pool. Facilities in the Apartment: garden access, Radio, DVD-player, CD-Player, Cable Channels, Flat-screen TV, Air Conditioning, Iron, Desk, Cable TV, Washing machine, Dishwasher, Dining Area, Private entrance, Tiled / Marble floor, Private pool, Shower, Hairdryer, Toilet, Bathroom, Slippers, Refrigerator, Tableware, Electric stove, Microwave, Blender, Toaster, Coffee Maker , Tea, Furniture outdoors, barbecue, dining area outside, Service “Wake Up”, Towels, Linen, Bicycle Rental. In walking distance, there are cafes and restaurants where you can have a delicious meal. Dolphin park where you can meet also manatees is in a walking distance. Our dive center provides a free shuttle service from Apart Hotel to the dive site and back. Transfer from the hotel to the Cenote Chak Mool will take only 12 minutes, To the Cenote Chiken Ha – 15 minutes. You no longer have to waste your precious vacation time in the long and tedious transfers. We value your time! Equipment is stored in the dive center, our staff will dry your wetsuits. There is a loyalty program for more than 30 days accommodation, please specify. Extra beds are available at an additional cost and by prior arrangement. This accommodation option does not accept travelers with pets. We are sorry, Rex! 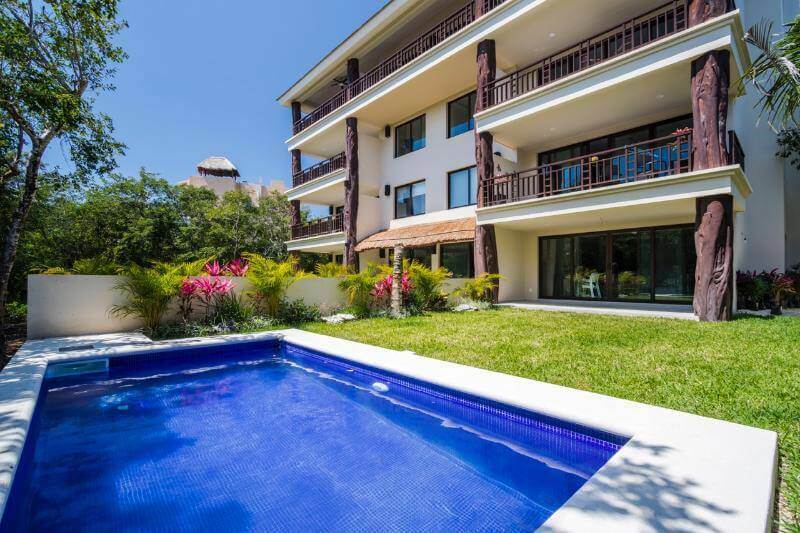 Lunamar is a new gated community in the North part of Playa Del Carmen just 15 minutes walk from the Playa Esmeralda beach. Great location with easy access to everything you might need during your stay and just 35 minutes drive from Cancun International Airport. This complex offers everything necessary to comfortably spend your time very close to the beach, shopping centers, entertainment and cultural and archeological sites. 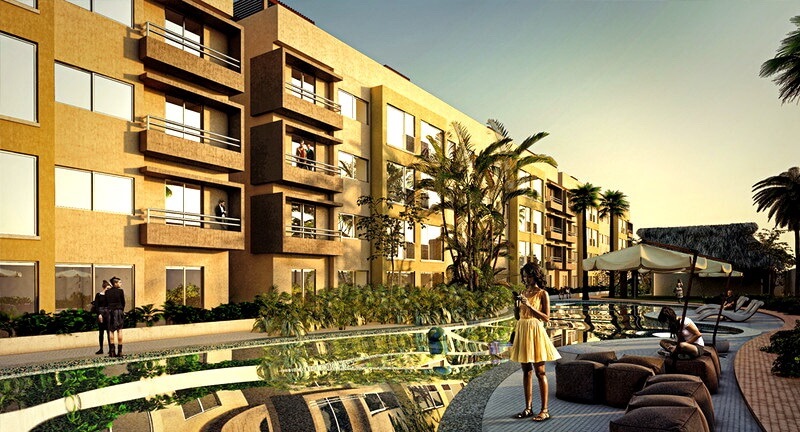 The development welcomes guests with a swimming pool, sun decks and shaded lounges. All our condos in Lunamar equipped with amenities like at home. Full kitchen: oven, big refrigerator, coffeemaker, toaster, blender, microwave, dishes, pots and pans. Internet, parking space, safe-boxes, bedding and plenty of fresh towels. You’ll also have a washing machine, dryer and iron with an ironing board for added convenience. So make yourself right at home.